Reapeal Day Party - Let's Party like it's 1933! 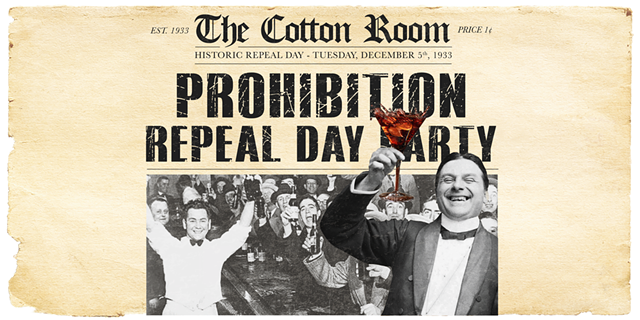 When: Sun., Dec. 8, 6 p.m.-2 a.m.
Mark those calendars, and join us Saturday, December 8th for our first annual Repeal Day Party! Enjoy our featured special of $5 Jim Beam Repeal Drinks and $9 Jim Beam repeal craft cocktails! Sport your best vintage garb and be entered to win one of MANY raffle prizes we will be giving away! (Participation in the attire is not required for entry but is required for eligibility for the the raffle / giveaways). This event is FREE but we do love a good RSVP so let us know if you are coming!